Old Hunter Cap with a wide brim that hides their sharp gaze. In the old days, when hunters were ten a penny, this was part of their standard garb. 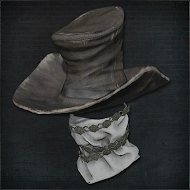 Old hunter top hat, warped by blood stains. In the old days, when hunters were ten a penny, this was part of their standard garb. 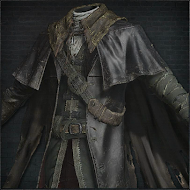 Old hunter garb. 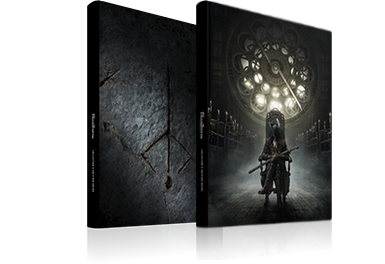 One day, the hunters disappeared, and Yharnamites began to whisper of the hunters' sin. Drunk with blood, chasing after beasts, they would pass on to the Nightmare, every last one of them. Old hunter gauntlets made of brass to protect their weapon-bearing hands. At the time, some hunters believed that certain metals would ward off beast blood. On a night of the hunt, it is no wonder that people would resort to superstition. Old hunter trousers that protected countless hunters from the beasts in an older age. A widespread belief of the period was that "beast blood crept up the right leg," and this led to the double-wrapped belt. 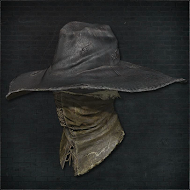 Old Hunter Cap has one of the highest Fire resistance of all head pieces. 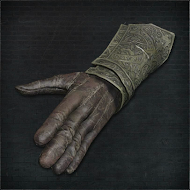 Old Hunter Gloves have one of the highest Physical defense of all Hand pieces. 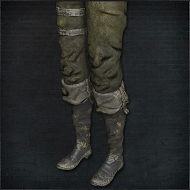 Old Hunter Trousers have one of the highest Thrust defense of all Leg pieces.